Stacy Adams is a shoe manufacturing company that holds its roots in the Brockton locality about 25 miles south of Boston, Massachusetts. The company was founded in the year 1875 by Henry L. Adams and William H. Stacy. The company is currently owned by the Weyco group who are based in Glendale, Wisconsin. The most basic and conservative form of dress shoes offered by Stacy Adams are the cap toe oxford shoes offered in a retro fashion. If you are looking for a well designed and durable pair of shoes that can meet your requirements then this is an ideal pair for you. Stacy Adams is in a league of its own when it comes to merging quality with fashion and heritage. The best way to describe Stacy Adams as a footwear company is that they are much advanced in comparison to other competing brands. The overall designs and look of the Men's Gala Tuxedo Oxford Shoe pays tribute to the heritage of the yesteryears. The 70s and 80s was an era of style and class and that is reflected in these shoes. Equipped with modern features that are conveniently priced at an affordable price range, these shoes really do steal the show. The pricing of these shoes is made based on their size. But even if you go for the largest size available, you won’t be paying more than $85, which is not a bad deal when you compare its many stylish features. This is one of the best possible options for a dress shoe that is offered in a retro Cap-toe designed oxford. These shoes are not only a best option for formal occasions but also for other informal activities as well. The overall design of the dress shoe is the familiar retro looking cap-toe design. This is not only paying homage to the golden era of fashion but also takes you on a nostalgic trip to the past all the while keeping you hooked on to the modern day comfort and price factor. The upper portion of the shoe is made from treated full grain leather for enhanced durability and reliability. The insides and outer lining sections of the shoe are all leather lined designed for increasing their comfort and longevity. The sole of the shoes is made from a synthetic material that ensures enhanced flexibility for taking those extra steps comfortably when avoiding the stairs is not an option. The synthetic sole is also equipped with anti-skid properties that enable it to provide the wearer with extra traction and grip on wet and slippery surfaces. These are not your typical wingtip dress shoes. These are a pair of simple yet elegant looking bluchers with a medallion-shaped toe section and a little bit of brogue design on the sides. These shoes are made in China, but that doesn’t mean that these babies will let you down! The overall shoe is attached to its synthetic sole with heavy-duty glue. There are no informal attachments like that of a metallic stud or thick threads that would make it really awkward to wear with a custom tailored suit. The heel section of the sole is equipped with a slight texture that adds to the traction and grip factor that keeps you from losing your balance and ultimately from an embarrassing fall. The pair of shoes offered from Stacy Adams is made from patented full grain treated leather. The sole is made from artificial or in other words a synthetic material that adds to the flexibility of the shoe as a whole. This makes the pair wearable for extended hours or for a brisk walk in case you feel like walking to work. The insole or the footbed insert of the shoe is made from memory foam that adds to the comfort quotient of the shoe. Giorgio Brutini Men’s Fallon shoes are made from faux leather yet it costs about the same as a pair from Stacy Adams. The former falls short compared to the latter as Stacy Adams offers the customer with inexpensive shoes made from superior treated leather. Giorgio Brutini has the benefit of adding the breathability factor to its pair of shoes which is not present in the one offered by Stacy Adams. It is a known fact that one makes the first impression to a person in the first few minutes during a chance encounter or an official meeting. Those few moments are very crucial for imprinting your overall identity on the person(s) in front of you. Your attire and especially your footwear plays a vital role in placing yourself in a favorable light in terms of credibility and capability that can prove to be the factor for you being successfully promoted to your dream job or losing the opportunity due to poor wardrobe choices. 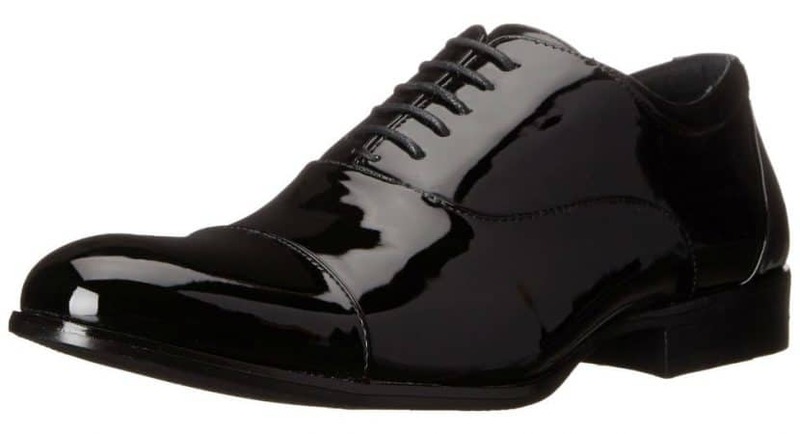 To sum it all up, the Men's Gala Tuxedo Oxford Shoe is a great pair of dress shoes from the house of Stacy Adams that is offered to you at an affordable price range.